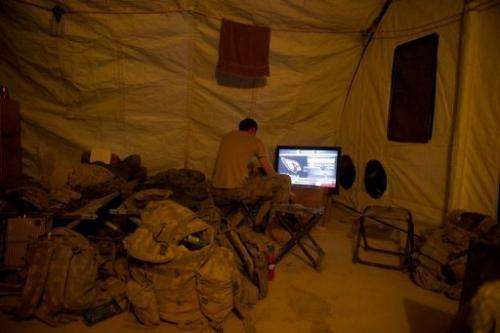 A US soldier plays video games inside his tent in Afghanistan in 2010. In battle they take out Taliban fighters with joystick-controlled weapons, while back at base American soldiers hook up their Xboxes and kill their way through video games. In battle they take out Taliban fighters with joystick-controlled weapons, while back at base American soldiers hook up their Xboxes and kill their way through video games. In Afghanistan, on and off-duty activities have become strikingly similar for US troops, as 21-year-old Specialist Tyler Sandusky can attest. Out on missions in the rugged northeastern province of Kunar, Sandusky locates distant targets -- day or night -- with remarkable clarity on a video screen within a giant armoured truck. "It's pretty fun watching people. They're so far away and they don't know you're watching," he told AFP as he demonstrated a system known as the CROWS (Common Remotely Operated Weapon Station). "It does feel like a game when you're driving along." Perched atop the vehicle is a .50 calibre machine gun with a firing range of more than 6.7 kilometres (four miles), which Sandusky operates through his screen and a joystick trigger to the right of his seat. "You see a red mist and then you know they're down," he said. Back at Combat Outpost Monti, troops drew parallels between the CROWS system and one of their favourite pastimes. "A lot of guys compare it to Call of Duty," said Sergeant John Henington, referring to the graphic video game franchise set in various battle zones. "We play that game most of the day when we're not doing anything." Aside from weaponry, technology has changed the lives of American soldiers immeasurably since the Vietnam War. No matter how remote their deployments, troops can watch TV on laptops, shop online and message their loved ones back home through Facebook and Skype. The changes may make life more comfortable in a war zone, but the evolution of weapons has brought with it ethical concerns. "It's the dehumanisation of the enemy," said Specialist Sean McCabe, 22. "We are the video game generation, so it's easy with the CROWS system to put it in a video game." The similarity is no coincidence, according to Deane-Peter Baker, a philosophy professor at the US Naval Academy. "Manufacturers of systems like this have deliberately sought to make their operation user-friendly" by designing Xbox and PlayStation-like controls familiar to young soldiers, he said. CROWS, in place in a number of US army trucks, significantly boosts troops' safety by removing the need for a gunner poking out of the vehicle. 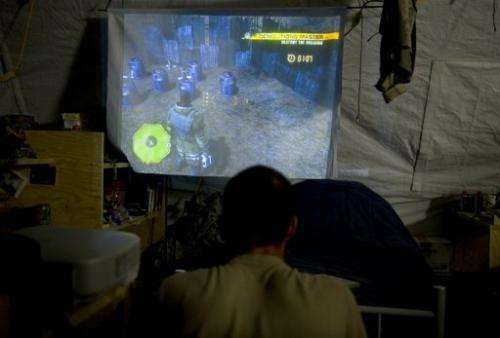 A US soldier plays video games near Kandahar city in 2010. In battle they take out Taliban fighters with joystick-controlled weapons, while back at base American soldiers hook up their Xboxes and kill their way through video games. "Imagine what it must be like to have half of your body sticking out of the top of a Humvee while bullets are flying in every direction," said Baker. "Even the coolest head would have difficulty in being as precise and discriminating with his or her fire under those conditions." The debate over technological advances is fiercest on the subject of drones, or unmanned aerial vehicles (UAVs), whose use the Obama administration has escalated dramatically against Taliban and Al-Qaeda safe havens in Pakistan. While studies vary, public policy institute the New America Foundation says drones have killed between 1,667 and 2,614 people in Pakistan since 2004, 20 percent of whom were civilians. At least partly because of Pakistan's official opposition to the attacks, the programme remains covert, and the identities of those targeted and killed are rarely revealed by American officials. Drones can also enhance intelligence-gathering by hovering over a target for up to 24 hours, said Peter Singer, author of a book on robotic weapons, "Wired for War". Then troops use hundreds of smaller drones for tactical purposes, such as the spying battery-powered Raven, which they can throw in the air like a model airplane to see over a hill. In February, manufacturer AeroVironment unveiled the Nano Hummingbird, a tiny remote-controlled and camera-equipped prototype that demonstrated 11 miles-per-hour flight and was able to accurately hover, rotate, perch and fly. The use of drones "is something that just a few years ago was seen as science fiction and is now the new 'normal' of war and counter-terrorism," said Singer, adding that 45 countries now operated them. Drones mean there is no risk of a pilot being shot down or taken prisoner. But the United Nations has expressed concern that drone strikes in Afghanistan and Pakistan could be breaking international laws against summary executions. Singer says drones lower the bar in the decision to use force, but US forces insist they are operated under high-level command and are the best tool for the job. "The other option is putting soldiers out in those areas, which I guarantee will piss people off much, much more, and probably result in much unnecessary bloodshed," said a US security officer in Kunar. I like this ...I just don't want the other side to catch up. And still the US is losing. When US forces leave the Taliban will still be there. I don't think so. The U.S. is far ahead of everyone else in 'virtualizing' war. As more and more soldiers kill via automation, they will gain experience and not die in the process. They will become more experienced 'virtual' warriors. Also, the huge budget for the American military will allow for a very rapid development of the machines that are controlled by these warriors. Believe it: the U.S. is being rapidly co-opted by corporations. It is becoming the most advanced military arm of the corporate culture. No doubt about it. When its "only" 20% civilians getting killed on the other side of the world, its kinda hard to get too upset about that, but then again, maybe they're thinkin the same thing? These system will become autonomous in the near future and the real fun will begin. Just imagine troops you don't have to pay benefits for, that is the dream of Pentagon planners.